Neenah, one of our expert stylists, has been doing hair for over 6 years. We recently had a chance to sit down and talk to her about her experiences in the hair industry, and ask her for some advice on taking care of your hair during these last few summer months. Question: How long have you been doing hair in Southern California? Question: What have you noticed about the local climate and how it affects peoples’ hair? Answer: People that live near the coast have to worry about frizziness because of their proximity of the ocean. More inland residents have to worry about the effects of the sun, including color fading faster than it would in less sunny latitudes. Question: What can people do to prevent fading and sun damage from happening? Answer: Those living closer to the coast should be using smoothing products like Eufora’s Smooth N Straightening Balm. People living farther inland should be using a UV protectant, as well as a color safe shampoo and conditioner to prevent the color from fading. A thermal protectant is a good idea for everyone, especially in the heat of SoCal. That seals the cuticle and prevents moisture from escaping in the heat. I recommend Eufora’s Beautifying Serum or Fortifi Strengthening Spray. Question: What if the damage has already happened? What steps can you recommend to help heal damaged hair? 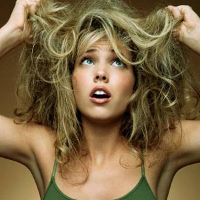 Answer: Customize conditioning treatments, depending on the damage of the hair. Here at Pistachio we carry carifying treatments, protein treatments, power dose moisturizers, vitamin C, and much more. Any of the stylists on our team would love to offer a free assessment and prescription for proper care, just call the salon to make your appointment. Thanks for your help Neenah!